Celebrate a 70th Birthday Party in style! Make this a party to remember! A 70th party is reason to celebrate. Celebrate health, personal accomplishments, and achievable goals for the future with friends and family! To make your own invitations find a favourite photo of the guest of honor. You can scan it into a computer and change the colour to a black and white or sapient color. Create a postcard looking invitation with all the birthday information on the back. 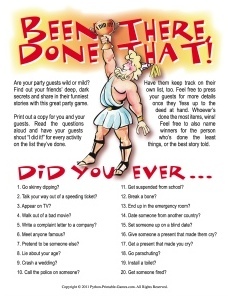 Our Adult Party Games page has lots of fun party games for any age! Make a scrapbook of their life! Share Your 70th Birthday Party Ideas Here!